This is how you cook a spaghetti squash in the crock pot slow cooker. 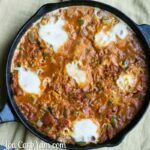 Once you make crock pot spaghetti squash, you will never bake it in the oven again. I don’t know about you, but I’ve always had trouble cutting a spaghetti squash in half so that it can be roasted in the oven. My husband usually ends up doing the cutting since I can never seem to get through the tough skin and the last time he almost cut his finger. I am happy to say that I will never have to deal with that again! 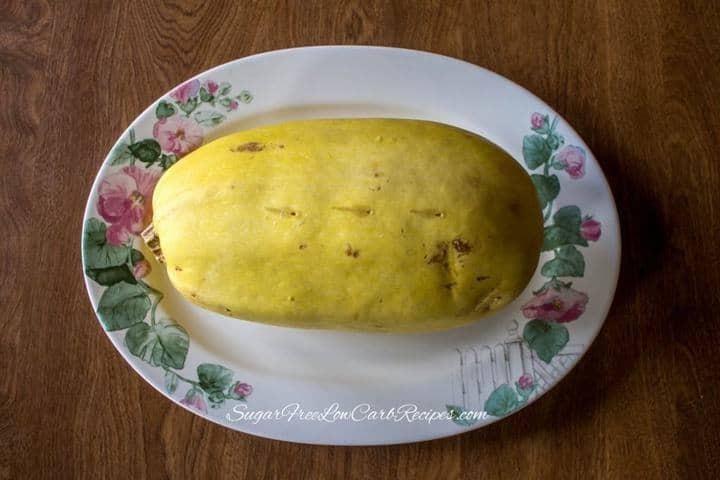 Did you know that you can roast a spaghetti squash in a crock pot slow cooker without cutting it in half? Well you can and it’s much easier than baking. I’m going to show you how to cook spaghetti squash in a crock pot. You just have to make sure you choose one that is a size that will fit inside your slow cooker whole. Apparently, I’ve been cooking spaghetti squash the hard way for twenty years. Why didn’t anyone tell me this little secret earlier? 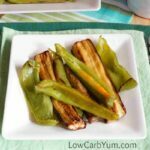 I just love spaghetti squash and now that I know how to roast it the easy way, I’m going to be eating it a lot more. 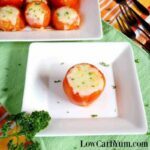 It is so simple to cook when you use a slow cooker. 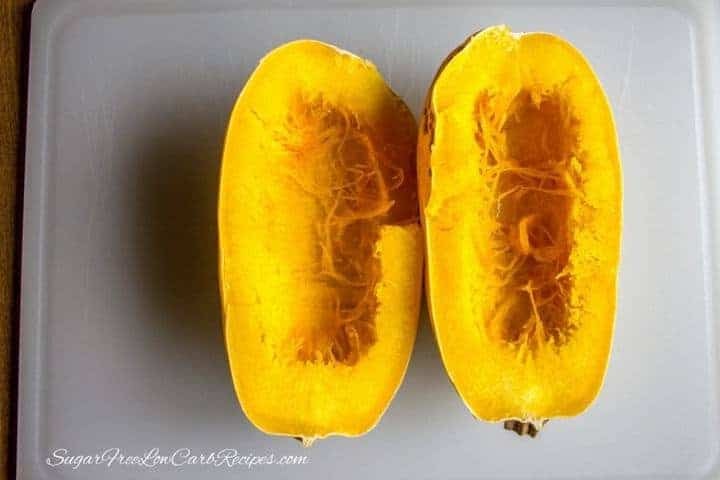 All you do is wash the squash, poke a few holes in it with a sharp knife, place it in the crock pot, add 1 cup of water, cover, then turn the pot on to either high or low. The spaghetti squash will be done in 3-4 hours on high or 6-8 hours on low. 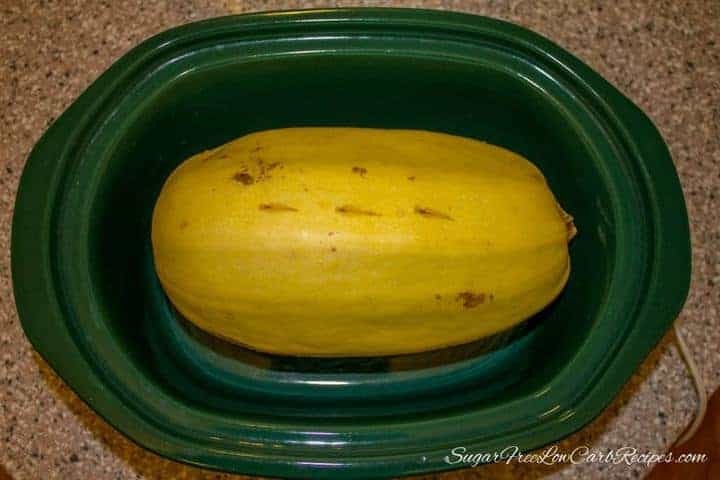 If you work an 8 hour shift and don’t want to overcook the squash, place the crock pot insert and squash in the refrigerator overnight. Then, before leaving for work, just take the squash and insert out of the refrigerator and put into the crock pot. 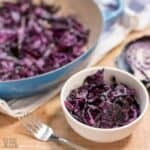 Having the insert and squash refrigerated overnight adds an extra hour cooking time for the low heat setting so it will ready after 9 hours on low without being overcooked. I picked a medium sized squash and it fit nicely inside my 6 quart oval crock pot. 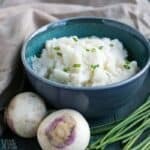 If you aren’t sure if the size will fit in your slow cooker, choose a smaller size until you get comfortable picking out the right size for your pot. If you have trouble getting a knife through the squash to poke slits in it, you can microwave it for about 3 minutes. Or, if you are going to be home while it’s in the crock, you can make the slits about halfway through the cooking time after the spaghetti squash has softened. The crock pot spaghetti squash came out perfect. I took this squash out just shy of 7 hours. I probably could have taken it out an hour earlier or an hour later. 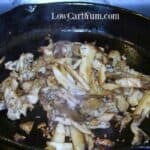 There is a lot of flexibility with slow cooking, especially on the low setting. And the best part? The knife went through the squash like butter. 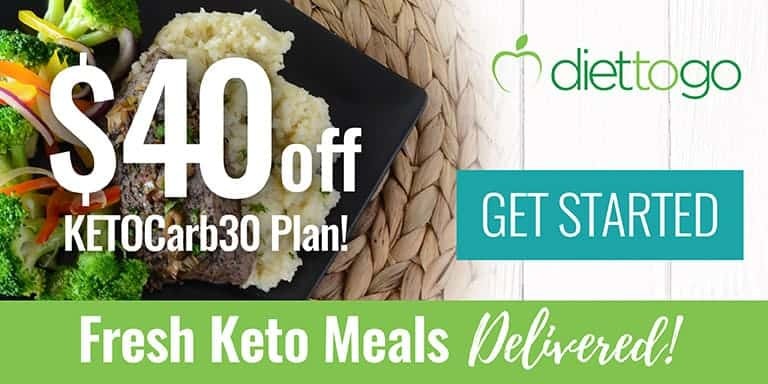 No more risk of chopped fingers! 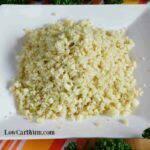 Spaghetti squash is a perfect low carb substitute for noodles. I particularly like it as a replacement for rice noodles in Filipino pancit. 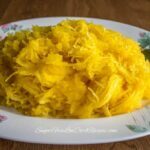 If you haven’t cooked spaghetti squash in a crock pot, you really need to give it a try. You’ll never go back to baking it in the oven. 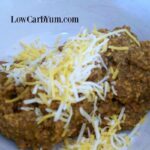 Cooking spaghetti squash in the slow cooker is so easy! Once you give it a try, you'll never want to go back to cooking spaghetti squash in the oven. 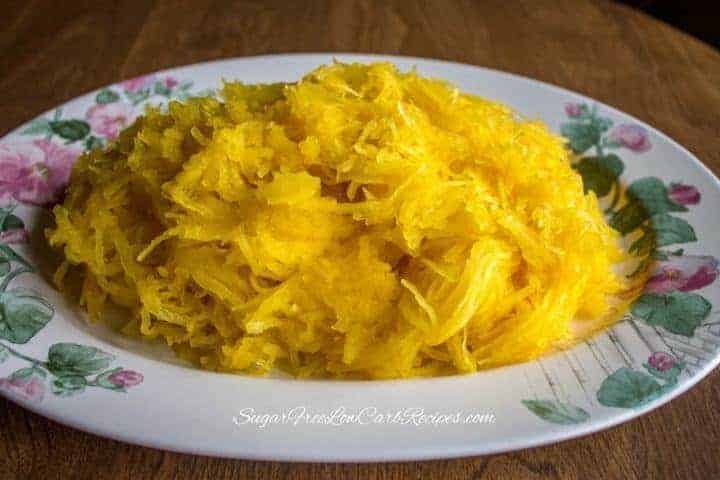 Wash spaghetti squash well then pierce 3 or 4 times with a knife. 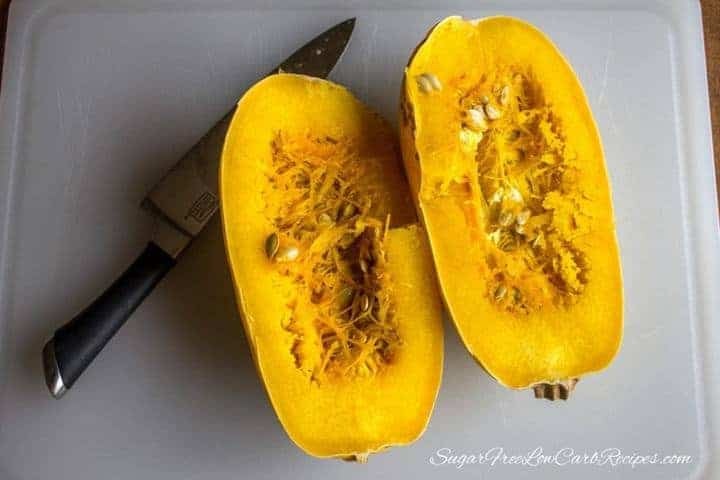 Place squash in crock pot and add water. Set crock pot to either low or high setting. 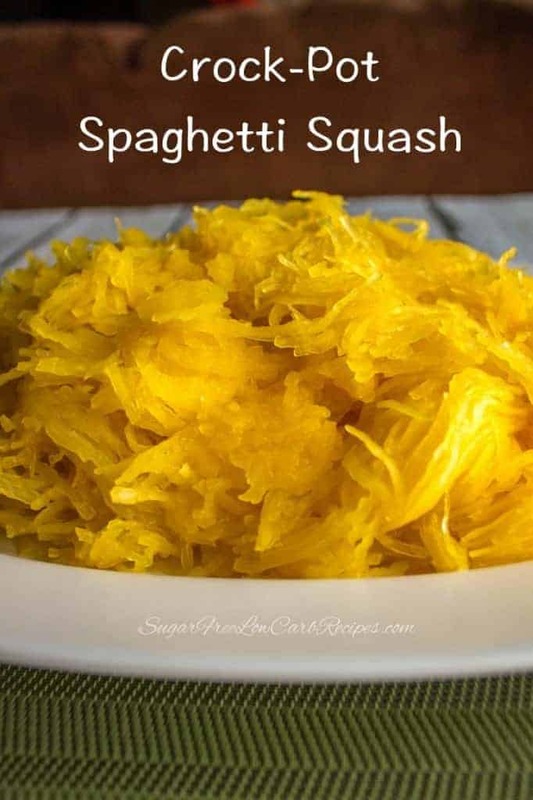 Remove spaghetti squash from crock pot and allow to cool 20-30 minutes. Cut squash in half lengthwise. Pull a fork along the flesh to separate the strands. To add an extra hour of cooking time to the low setting, simply put the crock pot insert and squash in the refrigerator overnight. The chilled pot and squash adds about an hour to the total cooking time. 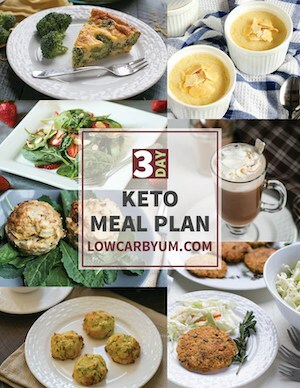 I tried this, and my spaghetti squash turned out mush. 🙁 I’m wondering where I went wrong. Put it on high, just shy of 4 hours, poked holes in it (maybe too many?) 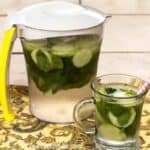 1-1/2cups of water. Did it mush up because I didn’t letbit cool for a 1/2 hour before cutting into it? Any insight is appreciated. It could have been the size. If smaller, it does cook faster. Cooling would only let it cook as bit more as it sits. I only poke a few holes so that may have also contributed. Spagetti squash is delicious no mater how its cooked/seasoned but I will defiantly try cooking it in the crock pot for our church pot luck next Sunday. Wonder how it would taste with crisp bacon added? 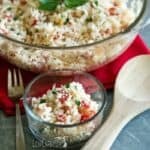 I’ll try it for our pot luck next week and let ya know! Hi…. i have just bought my first spaghetti squash and decided to follow your instructions. I pierced it several times but when i put it in the slow cooker and added water, it just floated ! Surely this cant be right? Only a small amount of water is needed, less than 1/4 inch in the crock. The squash should not float. I wash the squash and put in the croc pot for 4 hrs on high or 6 plus on low. No water, no holes. Cut in 1/2 scoop seeds and then scrape out the squash. Good to know it works out without the holes and water! As I read this, at home in my crockpot are two butternut squash, roasting away. I washed them and put them in the crockpot. No holes or anything. They will roast for about 9-10 hours until I get home. I then cut them open — an easy job at this point, scoop out the seeds (which I save to oven-roast), then scoop out the pulp. I add kerrygold butter, cinnamon, cardamom, nutmeg and some xylitol and mash together. But, I will now cook my spaghetti squash the same way. Although higher in carbs than spaghetti squash, butternut is another favorite of mine. I have not yet tried cooking in the crock, but will. Thanks for sharing your simple butternut squash recipe Brenda! How long do you roast the seeds? Temp? Oops! Definitely a mistake. Will fix it. Thanks for catching that Shayne!